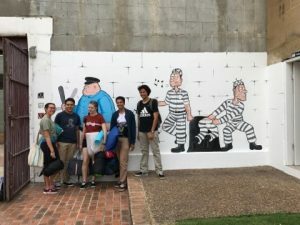 After studying elective Commerce together for two years, Year 10 students rounded out their studies with an excursion to the commercial hub of Sydney as Emily Stewart and Luke Green recount. 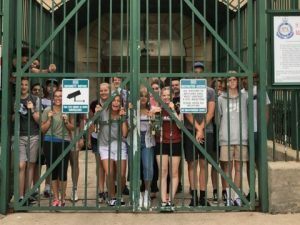 On the afternoon of Sunday, 20th November, 17 students and 2 teachers departed SCAS for Maitland Gaol to get a first-hand experience of what life as an inmate was like with a tour of the facility and sleepover. On the tour we learnt about the history and operations of the gaol and about what it was like to be a prisoner. We then had a choice of bedding down in C Block or the high security section which used to hold some of Australia’s most notorious criminals, including serial killer Ivan Milat. These days the gaol is no longer operational but home to a number of cockroaches much to the horror of some of us students. After a sleepless night in the ‘haunted’ gaol, we continued by bus to Sydney. 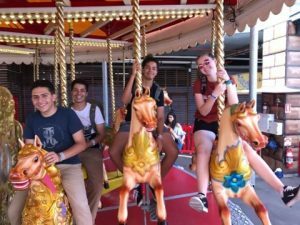 We began our Sydney tour with a trip to Luna Park to learn more about this business and then to experience the many rides that were on offer. That night we walked from our Darling Harbour accommodation to the Pitt Street Mall, where we purchased dinner and enjoyed some shopping before heading to George Street Cinemas where we saw the new release movie ‘Fantastic Beasts and Where to Find Them’. On the third and final day, we spent time in Sydney’s financial district, Martin Place. First we visited the Supreme Court where we saw a criminal murder case in progress, as well as a civil case. We had a quick lunch stop and then went to the State Parliament, where we learnt about the structure of the two houses and participated in a role play. We also visited the Reserve Bank to learn about its role in using monetary policy to smooth the economic cycle and how banknotes are issued. It was fascinating to see how the currency is made and to learn the state of the art security features of the new $5 banknotes. We all found the trip fun and worthwhile, as we could develop our knowledge of the class topics further in a real world environment. Thank you to Mrs Houlahan for organising such a fantastic trip (and for her skillful ‘big bus’ driving – ed.) and thanks to our Year Patron Mr Hurst for sharing the experience with us. Boogie wonderland at the Stage 1 disco!